One day, we rode 72 kms (our longest at the time). The very next day we rode 50 km with a handful of hills, the last [800 meters] of which was uphill. 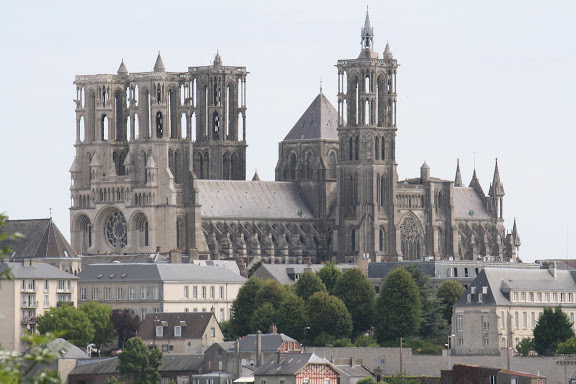 A true hilltown climb---up and up---to the cathedral and fortified city on top: Laon. 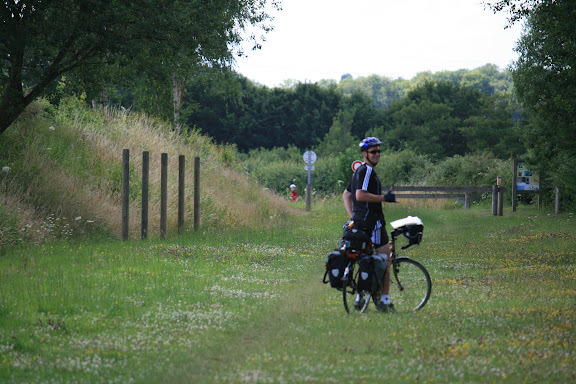 Riding TO Laon included the utter disbelief that when a map says 'signed, paved biking roads' indeed they may not be (see photo of James on the 'cycling path'). Then the flies. Oh the flies. Better call them larvae because they are miniscule and stick all over you while you cycle (on another day, I relinquished myself to the fact that I was a human size piece of flypaper, peddling between open wheat fields---it was an attempt at good humor). Oh, and it was Bastille Day in France so everything was closed and it felt like we were cycling from one ghost town to another (where do they all go to celebrate Bastille Day? Especially when you need a croissant or a toilet?). For the record: the ride to Laon was great, but the last 10 kms---not so great. And being super tired from two longish days of riding plus flies and hills and no scooby snacks... not good ingredients for the pudding (so to speak). But we made it. And the best is, well making it. The pride you allow yourself [with definitive gusto], that indeed you did climb that darn hill. You made it to the gorgeous cathedral, and when it was time for dinner you found an outdoor seat that was a couch, which was some such slice of heaven. One more worst of Laon, before I bring out the bests: the hotel. Yucko. Hey when you are on a budget you have to even out the curve. The average doesn't just create itself. So on the low side was a budget hotel in Laon (granted we have been in a few budget hotels that were shockingly impressive, in which we would have parked our bikes for a week... Pierrefonds, France, comes to mind). And it was dusky and dark and dank, with carpeted walls and peeling paint, flickering lights, a dark spiral staircase with long really old dark velvet green curtains whose only job was to collect decades of dust... it all felt... haunted if not entombed. And the glaring streetlight out the window didn't help. But sleepless nights didn't deter us. There was good to be found in Laon. And the best part was that the best finds were happenstance. The cathedral was gorgeous, the doorframe alone caused us to pause and stare, and stammer out loud about all the apostles, the statues and the animals at their feet. Which was which and who was who and how amazing this cathedral was centuries ago when it stood high and proud and ornate above the valley below. (Apparently cathedrals were built at great heights---specifically for better communications with heaven). And we walked the parameter of the hilltop, viewing a monestary that finally stood ramshackled, from its most recent war-time blows. Beautiful, but currently deserted. We found leaning towers and cools walls, and ran across one of the official temples of the Knights of Templars. And we found butterflies, gazillions of butterflies. 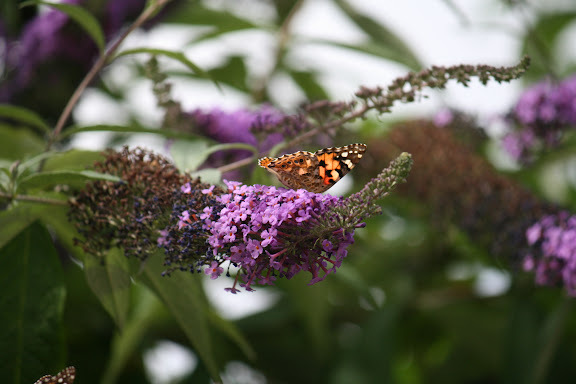 We now recognize a 'butterfly bush' when we see one. And last but most certainly not least: the best chocolate croissant. It may not mean much to you, but we have had our share of chocolate croissants on this trip. Now that I think about it, they pretty much replaced our stroopwafels (not by intention, we miss our stroopwafels---but as soon as we crossed from Netherlands to Belgium, stroopwafels were no where to be found). So once we started cycling in Belgium we started having chocolate croissants as our mid-cycle snack. So you can be sure when we sunk our teeth into the best-ever chocolate croissants from a tiny little bakery tucked along a thickly cobbled street in Laon, we were delighted... that we were close enough to turn around and buy a second. They were perfectly memorable. As was Laon, with all of its bests and worsts---because average wouldn't be average without the bests and worsts. It would just be boring. And the next day, we started by cycling down hill! what is in my panniers?